This page is dedicated to our seniors recent club results. 16 teams took part in the competition which was played over eighteen holes on a very pleasant Spring morning. Three teams had scores of less than sixty with only ten points separating first from last place. A brilliant blue sky, tempered by rather a cold wind, greeted the intrepid golfers on Wednesday. Many thanks to Andrew Green and Duncan Adshead for stepping up to replace the two very late withdrawals. Coffee and biscuits ( whole biscuits, not accessed from the broken biscuit counter) were enjoyed before battle commenced. 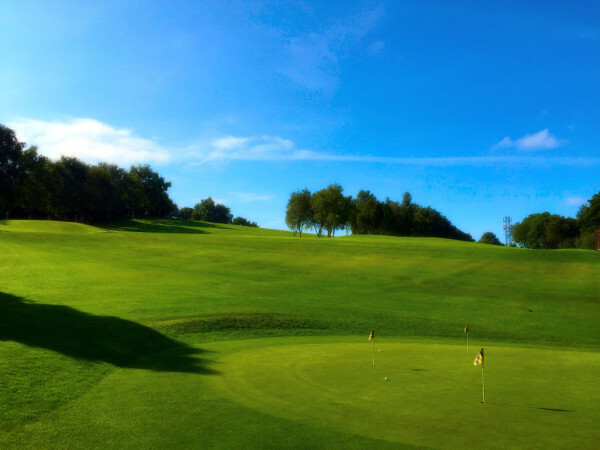 The course was in superb condition and proved to be a demanding test for all. 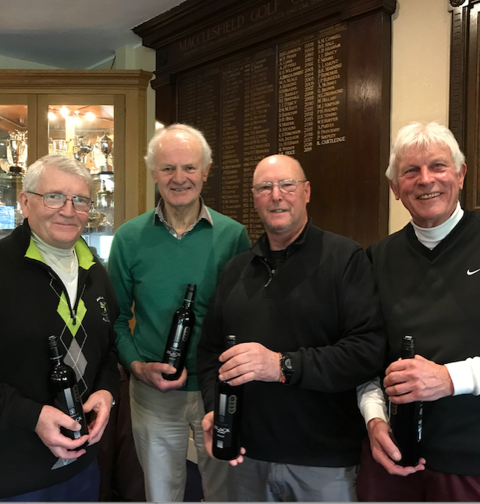 John Sherwood and Andrew Green proved hospitable hosts to allow the visitors to kick off with a win on the final hole and Peter Butler and Paul Wregglesworth were almost as generous in halving their match. All other games ended in victory for the home side. The players all enjoyed a welcome lunch of pintail Cumberland sausage with chips, peas and onion gravy followed by cheesecake. A “Mini-Comp” was arranged for those not involved in the match. 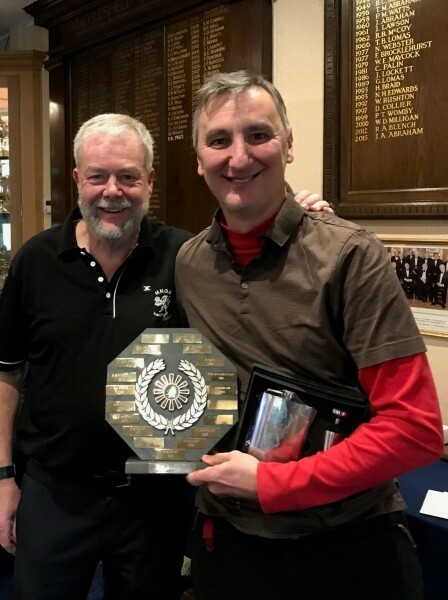 Forty one members took part, it was played over the full course and was won by Paul Sayer with 40 points playing off 19. After the conclusion of all matches we were served chicken curry with rice/chips and sticky toffee pudding and custard. The team from Buxton High Peak were very complimentary about both the state of the course for this time of year and the catering. It was good to see 3 golfers playing in their first seniors inter-club matches, everyone is always welcome. A “Mini-Comp” was arranged for those not involved in the match. Fifty one members took part, it was played over the full course and was won by Mike Hyde with 43 points playing off 29. 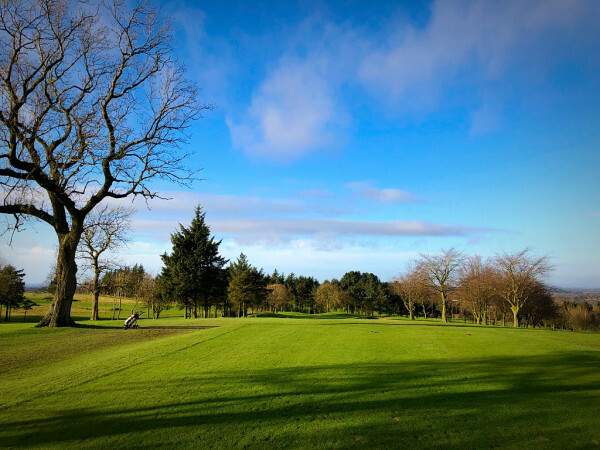 A lovely spring day at Bramall Golf Club greeted 47 enthusiastic senior golfers from Macclesfield Golf Club for the first of this year’s two away days. 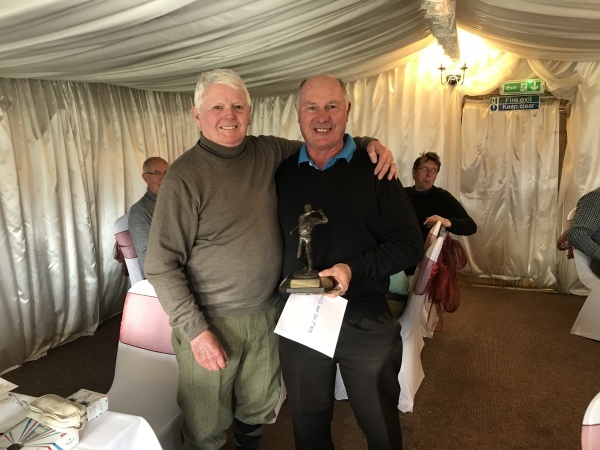 The event was organised by Neil Drummond who won the previous away day at Cavendish Golf Club in September 2018. The golfers found the course tough with only four scoring 36 points or better. In fourth place was Neil Drummond (handicap 12) with 36 points, beaten into 3rd place on a CPO by Em Williams (handicap 10. 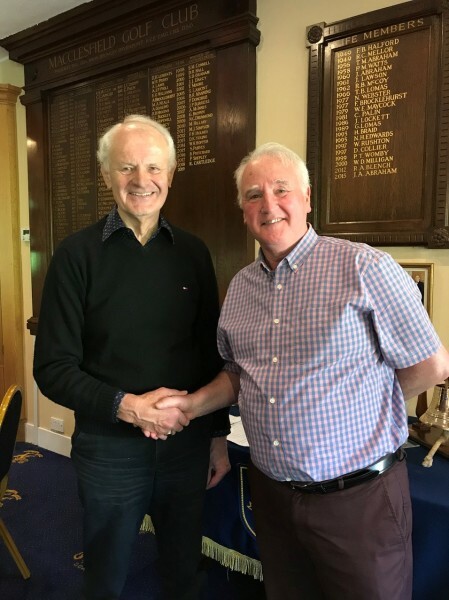 In runner-up spot was Rick Kershaw (handicap 22) with 37 points and the winner was Tony Lynn (handicap 26) with 40 points – many congratulations Tony. The toilet seat trophy was hotly contested with Mick Hickson running out the eventual winner. 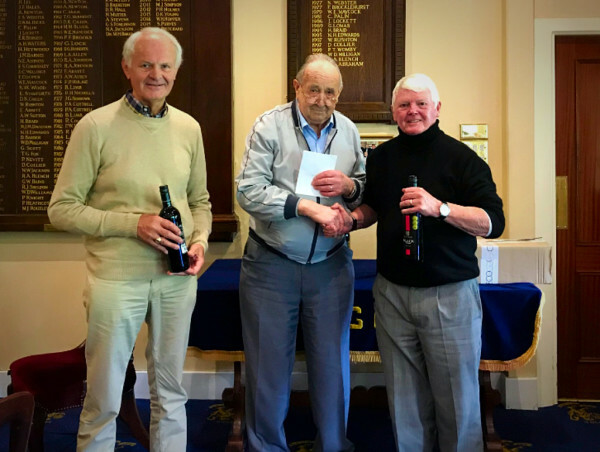 The nearest the pin prizes at the par 3 4th and 15th went to Peter Grantham and Peter Lloyd, respectively, and the nearest the pin in 2 at the par 4 13th went to Nigel Heathcote. Three balls were each won by Andy Curly and Peter Grantham for their two’s. Following the golf we all sat down to a very nice one course meal, thank you very much Bramall Park Golf Club for your hospitality !. Jack Darcy (20) 45 points c.p.o. Steve Clare (24) 45 points c.p.o. Ken Hall (24) 45 points c.p.o. Ken Rigby (23) 45 points c.p.o. Neil Jackson (13) 44 points. The Competition was played in very favourable Spring conditions which resulted in exceptional scoring. 37 of the 64 competitors scored par or better. There were six 2’s recorded by Mike Cooke, Mr President, Bill Williams, Jack Darcy, Mr Captain and Steve Clare. Very windy conditions made scoring very challenging. 16 teams took part. 9 points separated first from last. Dave Massey, Peter Ormesher, Jimmy Jones, & David Bye. 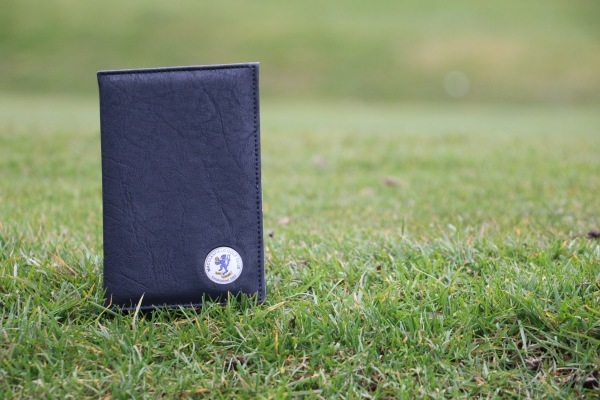 13 teams took part in the competition which was played over twelve holes. Four teams had scores of less than forty with only seven points separating first from last place. Congratulations to Ken, Pete, Phil and Lew on their victory. 15 teams took part on a glorious day of sunshine which led to some very impressive scores. Congratulations to Dave Sellers on playing seven outstanding rounds of golf which gave him sufficient leeway to have an off-day in Round 8. And well done to Pete Holmes whose endeavours at the end overhauled the 2017 runner-up Mike Hyde. 91 players took part and played 508 rounds over the competition. It was the first time in living memory (but then none of us can remember anyway) that all rounds were played on the scheduled dates! out on the card play-off. 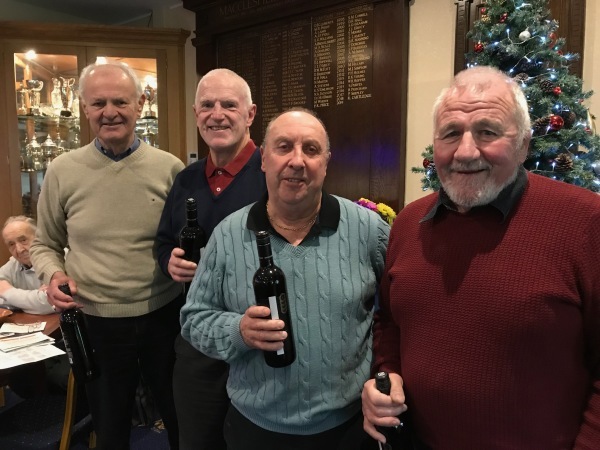 The final round of the Winter League produced some outstanding scoring with nine scores of 40 or more with a further 14 competitors beating their handicap. 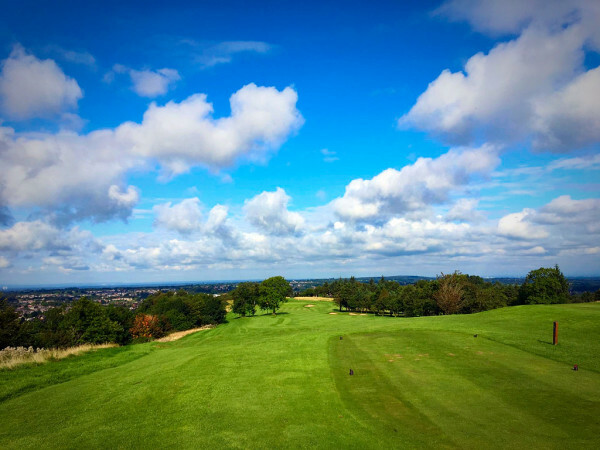 Congratulations to Pete Holmes who followed up his impressive performance in Round 7 (30 points over 12 holes) with a total of 46 points playing off 9 – yes, that’s one under gross!! 15 teams took part. 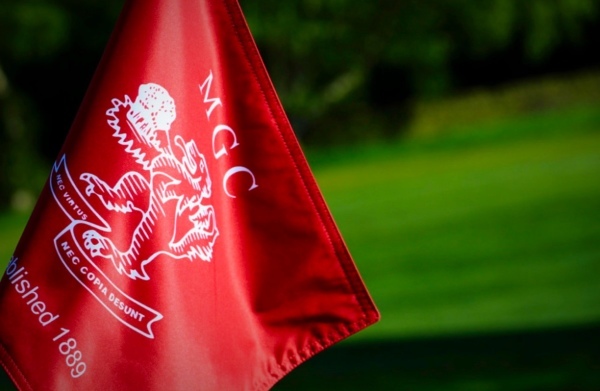 14 points separated first from last & by a strange coincidence the winning score was the same as the winning score for the last Seniors Am – Am played in October and the previous one played in June. 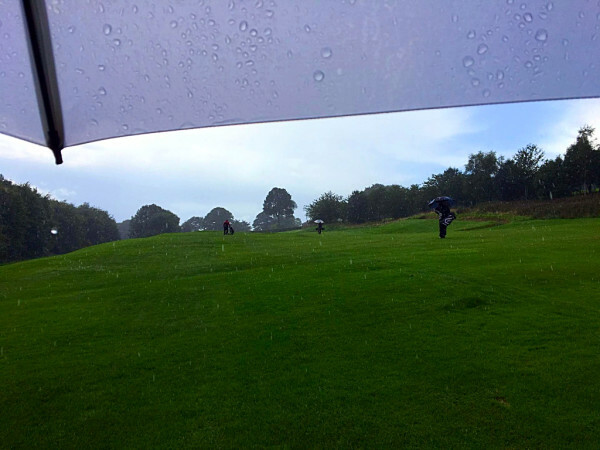 The competition was played over 12 holes due to the wet course conditions. There were 53 combatants (the lowest of the year) and the average score was the highest of the season, 23.1 which is equivalent to 34.6 over 18 holes. This has resulted in the top eight finishers having their handicaps reduced for the final round. 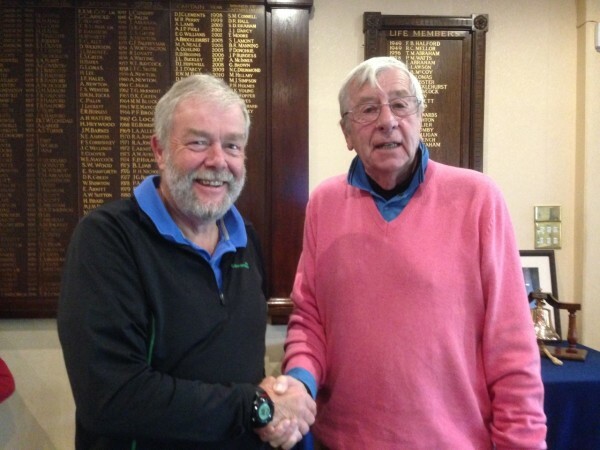 Congratulations to Dave Sellers who reinforced his lead in Winter League taking his best 5 total past 200 to 205. Mike Hyde moved up from 5th place to become the principal challenger on 193.5 points while Pete Holmes advanced from 12th place to tie for third with Steve Clare on 188. Paul Wreglesworth is just one point further behind. Another big win for Rick who is deducted two more shots for the remaining rounds and a shot off each for Ken and Phil as their grossed up scores exceed 40. There are five new entrants into the Top Ten as competitors complete five rounds or make amends for a bad earlier round. The high fliers are Paul Sayer up to 3rd, Mike Hyde to 5th, and Phil Davies and the “Robinson Boys” claiming 8th, 9th and 10th spots. Dave Sellers hangs on to top position but Steve Clare closed the gap by 4.5 points. Paul Wreglesworth increased his best five scores by 6 to remain in contention. If all the current top ten players score 40 in each of the last two rounds, the rankings would end up with Dave Sellers the winner on 201 points, Steve Clare runner-up followed by Mike Hyde, Paul Wreglesworth then Ken Brown and Dave Robinson. If Dave S failed to add to his current score, only three of the pursuing pack could overtake him. But you can never tell in the beautiful game of golf!! 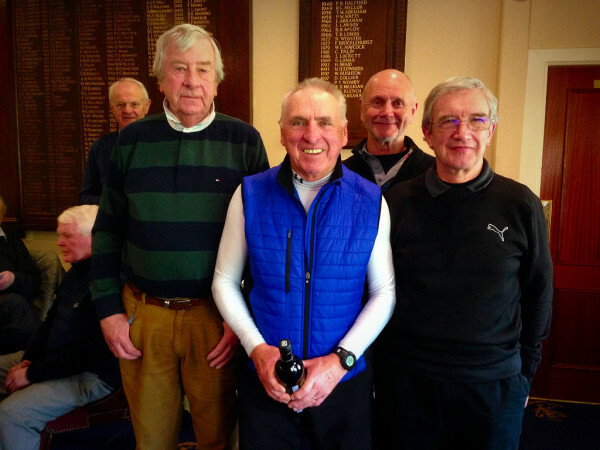 Congratulations to Rick on his success in his first Winter League round with the Seniors. 62 seniors contested Round 5 of the Winter League. In spite of the wintry conditions, but with compensation from the least wind of the competition so far, the average scores were little different from the average to date in this competition. As in previous rounds the players scoring 40 or more points will have a one shot reduction in their H/C for the remaining rounds of the W/L. Within the top 10 the biggest climbers were Paul Wreglesworth up four places to third and Pete Holmes up three places to fifth. Best performances just outside the top ten saw Mark Harbord rise from 12th to 8th and Adrian Lamb rise eight places to number 10. Steve Clare remains in second spot. There were 3 twos for Phil Davies, Tim Robinson and Mark Harbord (again!). The format of the competition is such that there is still a lot to play for and do not overlook the dark horses who have only played 4 rounds; Phil Davies, Tim and Dave Robinson are handily placed to mount a challenge. Congratulations to Phil, John, Tim & Jimmy on their victory. 13 teams took part in a closely fought competition with all teams scoring well over 100 points. The annual BAPTAP competition saw the introduction of fairway mats. This produced some notable scoring with eight members scoring forty or more points, the very impressive winning score of 46 points being produced by David Sellers, Steve Clare was a close runner up with 45 points. 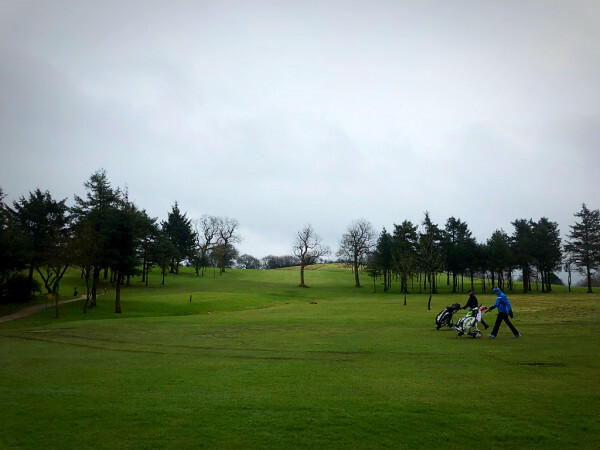 61 seniors contested Round 4 of the Winter League on a very blustery morning which thankfully remained fairly dry! There were 4 twos for which Ivor, Phil Cockburn and Adrian Lamb took the more conventional route while Mark Harbord chipped in on the 15th! You still can’t draw any conclusions after 4 rounds but there is a mini breakaway group led by Paul Sayer on 153 followed by Steve Clare and Dave Sellers both on 151. Next is Jimmy Jones on 141. We now take our midwinter break from winter league and look forward to renewing rivalries in the New Year. Congratulations to Paul, Rod, Paul & Andrew on their victory. 17 teams took part, clearly the cold weather and strong winds had an influence, & this is reflected in the scores where the winning score was 10 points lower than the winning score in the last Disco played in August. Sixty eight members took part. Another close competitive round where several members scored 38 points and were not in the prizes. Congratulations to Steve Clare and Paul Sayer, this takes them into the top 2 places, leapfrogging Michael Hyde who drops to third, far too early to draw any conclusions. As a result of this Steve Clare, Paul Sayer and Jimmy Jones will enjoy lower handicaps for the subsequent rounds, all losing one shot. Only 51 members took part in this event, the lowest number of participants in a Seniors competition for several years. For most, conditions proved to be challenging with several bursts of rain and strong winds, but not so for the winners. The runners up spot was only decided by a card play-off, going to the last six holes & even then there was only one shot in it. Bad luck to Adrian Lamb, Pete Holmes, Vic Barlow and Nigel Heathcote. Dave Robinson 37 points c.p.o. Bob McGrouther 37 points c.p.o. Congratulations to Mike Hyde on another excellent round, as a result of this he, along with Brian Justin and Paul Sayer will enjoy lower handicaps for the subsequent rounds, all losing one shot. NETT SCORE - 94 points. NETT SCORE - 86 points. 19 teams took part. Three teams came close to winning second prize with 85 points. Bill Williams playing off 17 with 39 points C.P.O. Clive Howlett playing off 18 with 39 points C.P.O. Ken Rigby playing off 22 with 38 points C.P.O. 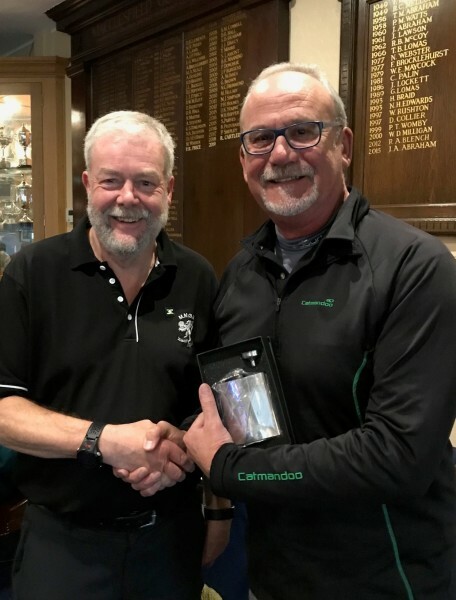 Congratulations to Peter on another win in 2018, this follows his second place in the away day at Cavendish on Monday 3rd September. Sixteen players played to par or better. Congratulations to Ken & David on their victory. 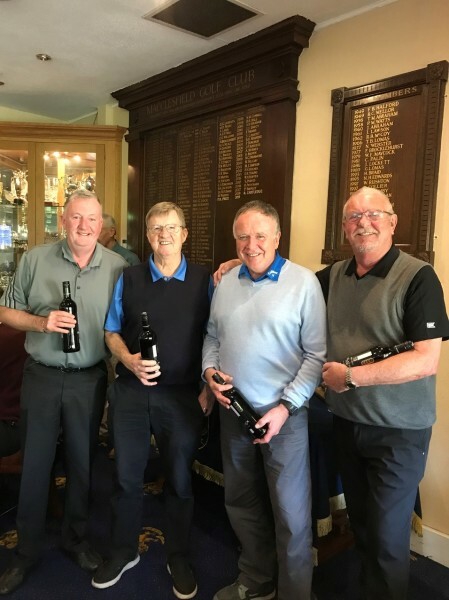 16 teams took part in this annual foursomes event which celebrates the beginning of the “Seniors” section at Macclesfield Golf Club. We were privileged to have two of the original “Founders”, George Norton and Bill Blackledge, in attendance for the presentation. Bill carried out the presentation to the three prize winning teams. Clive Howlett HCP: 18 NETT: 67C.P.O. Mike Tanner HCP: 18 NETT: 67 C.P.O. Rod Price HCP: 17 NETT: 67 C.P.O. Paul Wreglesworth HCP: 17 NETT 68 C.P.O. Alan Arden HCP: 28 NETT: 68 C.P.O. BEST GROSS: Pete Holmes 79 C.P.O. 69 seniors competed for the June Medal. as part of the Medal competition. Thanks go to Alan Corbishley and Bill Hopper for providing the prizes for these competitions. In pleasant conditions on a course returning to lush green fairways 16 members ( 23% Of participants) scored par or better, at the other end of the scale there were only 3 N/R’s (4% of participants). This means that MMGG have qualified for the finals days on Monday September 24th along with Shrigley Hall from the South Zone. We play them on September 11th (our last league fixture) to determine who tops the South League and who the runners-up are. 66 Seniors competed for the 2018 Les Allen Trophy. Andrew Curley playing off 15 with 42 points C.P.O. Lew Wardle playing off 20 with 40 points C.P.O. Rod Price playing off 17 with 40 points C.P.O. the first time. The Trophy was presented by Barbara Allen. 68 seniors competed for the 2018 Presidents’ Prize. Despite the dry & difficult conditions ten people broke 70. 11 competitors had a No-Return. Phil Cockburn HCP: 16 NETT: 67 C.P.O. Harry Amis HCP: 21 NETT: 67 C.P.O. Bill Williams HCP: 17 NETT: 67 C.P.O. Steve Longdon HCP: 14 NETT: 67 C.P.O. prizes on a card playoff. Congratulations to Peter on his excellent performance and also achieving his life-time goal of getting a gross score lower than his age. This is something that has been rarely achieved by a member of MMGG. 17 teams took part and every team had a score in three figures. Three teams tied for third place with a score 124 points. Pete Ormesher HCP: 15 NETT: 68 C.P.O. Peter Ainsworth HCP: 18 NETT 68 C.P.O. David Sellers HCP: 21 NETT: 69 C.P.O. BEST GROSS: Neil Jackson 79. A first medal win in the “Seniors” for Bob, congratulations Bob. 68 seniors competed for the June Medal. In pleasant warm conditions on a very dry course 17 members ( 25% Of participants) scored par or better, at the other end of the scale there were 7 N/R’s (10% of participants). A cloudy day with a gentle breeze helped to keep everyone cool. 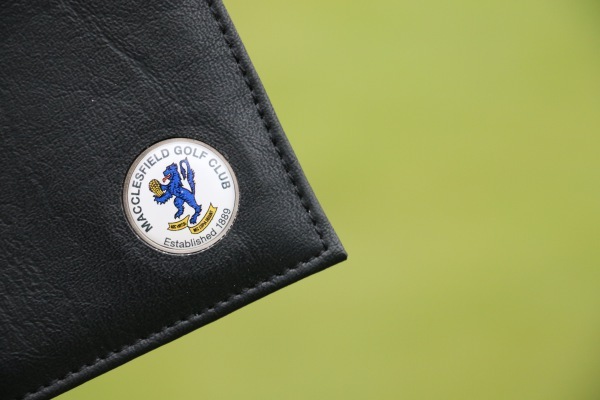 Knutsford commented on the good condition of the course, really enjoyed the matches and appreciated the hospitality given by the Macclesfield Golf Club members. This was a new fixture for them and they look forward to playing the friendly matches again next year. The course was in great condition and we were all well looked after. All matches were played in a friendly spirit and we were served a nice meal to cap an enjoyable if not successful day. 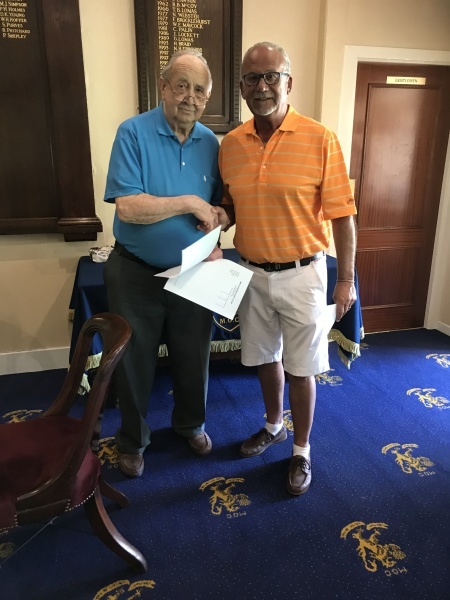 60 seniors competed for the 2018 Captain's Prize. In very dry and hot conditions only three people broke 70. 20% of the competitors had a No-Return. Phil Davies HCP: 21 NETT: 69 C.P.O. Mark Findlow HCP: 13 NETT: 69 C.P.O. Peter Ainsworth HCP: 18 NETT 72 C.P.O. Mike Guerin HCP: 22 NETT: 72 C.P.O. There were six two’s and a hole in one which was achieved by David Hopewell, congratulations David. Friendly company and hospitality given with a nice meal to finish things off. 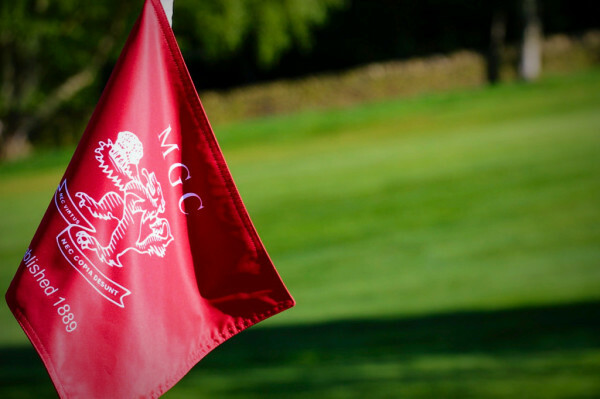 MGC had the pleasure of welcoming guests and members to this years Seniors Open. Conditions were excellent anf the course immaculately presented. There were some good scores with 20 teams scoring 40 points or better. An excellent meal finished off a great day. Well done lads. Alan Bishop with 94 points winning on a card play-off. also with 94 points but losing out on a card play-off. taking part in other events, 13 teams took part. In windy conditions only two people broke 70. Not a day for the low handicap members. Bill Delahunty HCP: 24 NETT: 70 C.P.O. Steve Clare HCP: 24 NETT: 70 C.P.O. Brian Justin HCP: 21 NETT 70 C.P.O. David Bye HCP:18 NETT: 70 C.P.O. The second consecutive month that Em has recorded the best gross, despite this his H/C increased! 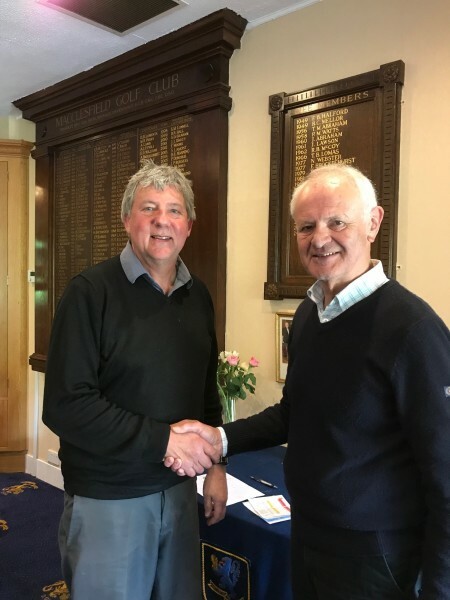 Congratulations to Ian Wilson who was also presented with his hole in one tie which he won in the Men's Saturday Brocklehurst Cup played a few of weeks ago. triumphant by an overall margin of seven. for their indifferent performances on the day. These thoughts were shared over an enjoyable hot-pot lunch. In the match played against Shrigley Hall G.C. at Macclesfield, as with all league matches, the first four results contribute to the MDS league. A critical match as current league standings suggest that one of these teams are likely to win the league. A much closer match than the reverse fixture played in April. A “Mini-Comp” was arranged for those not involved in the match. 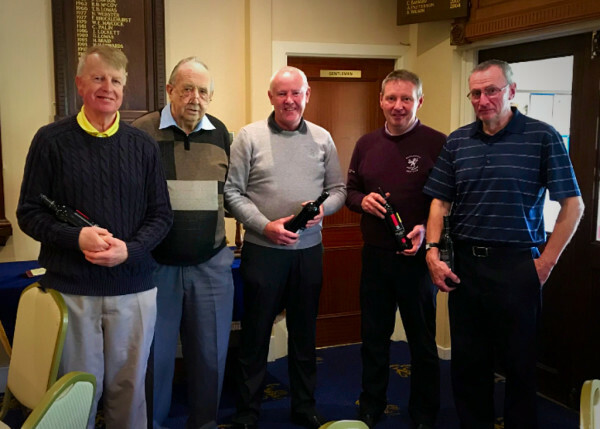 Forty six members took part, it was played over the full course in rather wet conditions and was won by Ken Brown with 40 points playing off 28. Macclesfield Seniors played Knutsford Seniors for the first time and enjoyed a fabulous course although very wet. The hosts made our team very welcome. Ken Herat also with 39 and Bernard Mc Growther with 38. 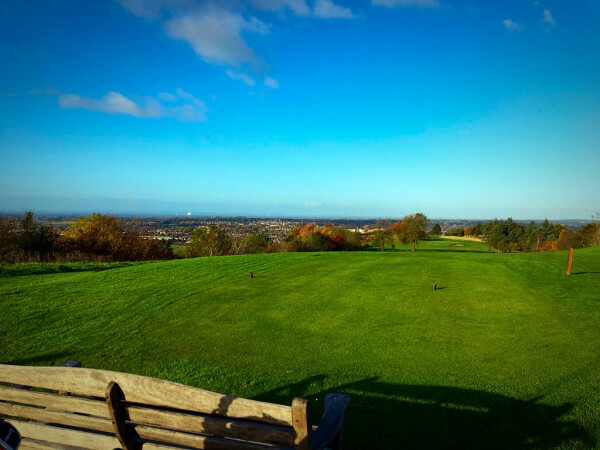 This return match at Cheadle Golf Club was played on a nice sunny day, with all matches played in friendly spirit. The course was in a good condition and we were given a very nice meal afterwards. Members not involved in the Cheadle match took part in a Mini Comp at Macclesfield. Forty eight members entered the Stableford competition with Anthony Harris winning with a score of 40 points playing off a handicap of 21. 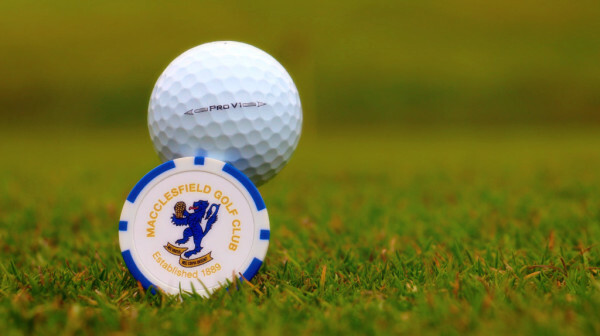 It was a very pleasant spring days golf and a good result for Macclesfield making the most of home advantage. 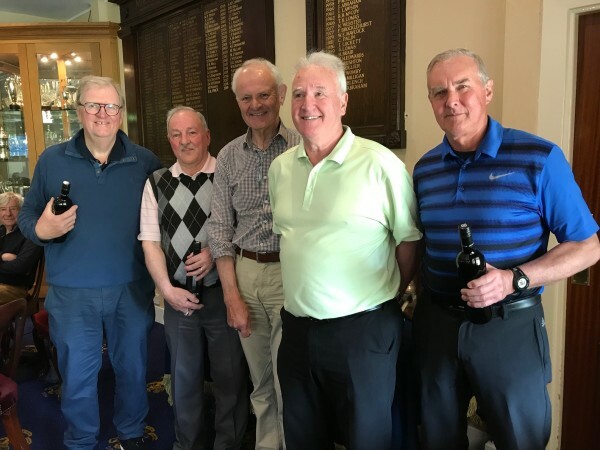 The Cheadle golfers enjoyed the day despite the score and commented on the excellent condition of the course, the lovely meal and the sporting spirit in which all the matches were played in and look forward to the return match at Cheadle next Wednesday 9th May. It was nice to play on a flat course although with the steady rain during the whole of the course got very wet. The match was played in a good spirited and friendly atmosphere. Many thanks to Styal for their hospitality. Mark Harbord net score 70 playing off 18 c.p.o. Neil Drummond net score 70 playing off 12 c.p.o. Alan Arden net score 72 playing off 28 c.p.o. Vic Barlow net score 72 playing off 22 c.p.o. Peter Lloyd net score 72 playing off 18c.p.o. Today saw the Seniors play the first Medal Competition of 2018, it was a memorable occasion in that Alan Corbishley played his first game of his 91st year. 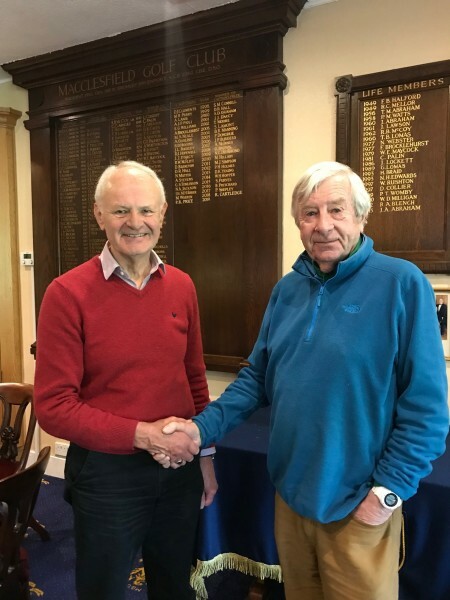 A presentation was made by the Captain on behalf of Macclesfield Golf Club to commemorate Alan’s 90th birthday which he celebrated on the 20th April. A presentation on behalf of the Seniors was made by Bill Hopper. ten shots separated first from last. Rod Price and Chris Doyle with John Robinson and John Webster were more generous and gave the score line some respectability! Despite a rather chilly start everyone stayed dry and enjoyed the day. Everyone was impressed with the state of the course and the catering was much appreciated. A “Mini-Comp” was arranged for those not involved in the match. Thirty six members took part, it was played over the full course and was won by Peter Ainsworth with 40 points playing off 18. Special thanks given to Mark Hillaby for getting the course ready to enable the 12 hole match to be played after all the poor weather (most of Buxton High Peak members didn’t expect to play at all) and to Jodi and her staff for putting on an excellent meal. A “Mini-Comp” was arranged for those not involved in the match. Twenty two members took part, it was played over 12 holes and was won by Chris Bowden with 29 points. Pete Holmes 36 points c.p.o. Peter Ainsworth 36 points c.p.o. Phil Davies 35 points c.p.o. Peter Lloyd 35 points c.p.o. Paul Sutcliffe 35 points c.p.o. Congratulations to Brian on winning on his first Seniors Away-Day. 41 members played in the competition in what the scores demonstrate was a very closely fought event. Two’s were recorded by David Earl and Nigel Heathcote. Martin Gravestock 40 points c.p.o. Adrian Lamb 40 points c.p.o. Congratulations to Phil on an excellent score which promotes him into the top ten in the final placings of this seasons winter league. 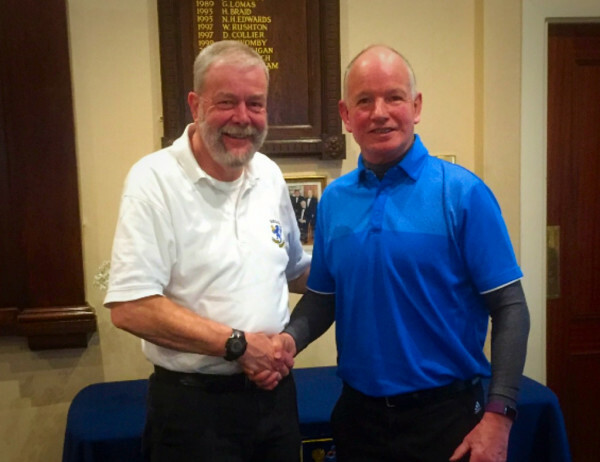 No amount of handicap reduction could prevent Peter Ainsworth from winning the Seniors Winter League at his first attempt as he finished with a best five rounds totalling 202.5. The runners-up slot was a very close call between reigning champion Andrew Green and one of his former Kings School colleagues, Mark Harbord, both on 198.5. Mark was runner-up in 2016 and lost out on the win based on a tiebreak. This time he prevailed under similar circumstances leaving Andrew in third place. Vic Barlow came fourth on 195 just half a point ahead of Tony Lynn. Sixth spot went to another debutant, Andrew Curley, on 192 while captain elect Rod Price had to settle for seventh with a tally of 191. There have been many postponements due to the weather but it has been possible to stage 6 out of 8 rounds over 18 holes and credit must be given to Mark Hillaby and his team for producing remarkable course conditions given the extreme weather we have experienced. Thanks for all the support from the Seniors Section; almost 500 rounds were played out to bring Winter League 2017/18 to a conclusion. The delayed Seniors Winter League round seven was completed today. Clive Howlett 38 points c.p.o. Vic Barlow 38 points c.p.o. Harry Amis 37 points c.p.o. Pete Tinkler 37 points c.p.o. The Competition was played over the full 18 holes under difficult windy conditions which is reflected in the scores recorded. After seven rounds there is no movement in the top three but Vic Barlow moves from 11th to 4th and Chris Bowden who has now played five rounds shoots up from 46th to 13th! 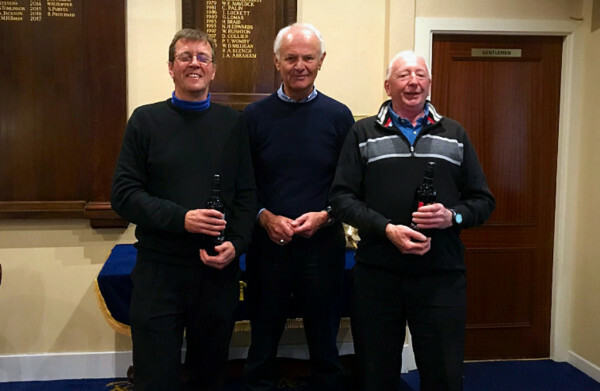 It’s not impossible (particularly with some of the scores we have in the seniors) but the winner looks likely to come from the first three in the table – Peter Ainsworth, Andrew Green or Mark Harbord. Vic would need to score 44.5 to take an outright lead assuming Peter does not improve on his lowest counting score of 34. Andrew needs to score at least 37.5 and outscore Peter by 4 clear shots to retain his title. There were no handicap reductions today. 62 members played in the competition. 12 teams competed in a close competition where only nine shots separated first from last. The much delayed Seniors Winter League round six was completed today. John Pemberton 29 points c.p.o. Vic Barlow 29 points c.p.o. Andrew Green 29 points c.p.o. Ken Hewat 28 points c.p.o. The Competition was played over 12 holes, congratulations to Alan on a very impressive score. The first seven will have shots deducted from their handicaps for the remaining two rounds. 55 members played in the competition. The competition was played over 12 holes in very blustery and snowy conditions. Rod Price, Steve Clare and Ivor Williams with 51 points. Chris Doyle, Pete Tinkler and Paul Eifflaender with 50 points. This was played over a shortened course of twelve holes. Paul Carroll, Ed. Beckett and Paul Wreglesworth with 81 points. The Seniors Winter League round five was completed today. Jonathan Hogg 41 points c.p.o. Andrew Green 41 points c.p.o. Brian Justin 40 points c.p.o. A fairly tight round 5 resulted in seven players scoring forty or more with Mark Harbord the outright winner for the second time. Mark by four points, but Andrew Green moves up to 3rd (in part because some of those previously ahead of him did not play Round 5). David Earl 27 points c.p.o. Em Williams 27 points c.p.o. Ken Rigby 27 points c.p.o. The Competition was played over 12 holes, congratulations to Mark on an exceptional score. 59 members played in the competition. due to inclement weather conditions. The Seniors Winter League round three was completed today. Steve Longden 40 points c.p.o. Mark Harbord 40 points c.p.o. Congratulations to David on his success. 17 teams competed in a tightly fought competition. The Seniors Winter League round two was completed today. Harry Amis 39 points c.p.o. Martin Gravestock 39 points c.p.o. Tony Lynn 39 points c.p.o. Mike Tanner 39 points c.p.o. Congratulations to Paul on his success in another very closely contested round with five members all scoring 39 points. Life Member Ron Blench was the unlucky one who missed out on a prize, based on a back nine count back. Both Paul and Mark will be deducted one shot from their handicaps for the remaining six rounds. Bernard Taylor, Bill Hopper, Bill Williams & Ivor Williams with 60 points, winning on a card play-off. Chris Bowden, Chris Fisher, Jonathan Hogg and David Earl also with 60 points. The Seniors Winter League competition is underway. Lew Wardle 39 points c.p.o. Bill Barclay 39 points c.p.o. Don Bayley 39 points c.p.o. Ken Hewat 38 points c.p.o. Congratulations to Peter on his success in a very closely contested round. He will be deducted one shot from his handicap for the remaining seven rounds.